How to add a certificate sign to PDF files? Now I need to add a certificate sign to pdfs. Which tool do I need for this task? Description: Batch add electronic signatures and encryption to PDF files from command line. -signrect <string> : Signature annotation rectangle, e.g., -signrect "x,y,w,h"
-signdocperm 1. Any change to the document invalidates the signature. -signdocperm 2. Permitted Filling Forms, Instantiating Page Templates and Signing. Other changes invalidate the signature. -signdocperm 3. Include 2, as well as Annotation Creation, Deletion and Modification. Other changes invalidate the signature. Dim strInFile As String = strFolderDir & "\readme.pdf"
Dim strOutFile As String = strFolderDir & "\_test_out.pdf"
Dim strLicenseKey As String = "-$ XXXX-XXXX-XXXX-XXXX"
Dim strCmd As String = "-cername ""VeryPDF"" -signrect ""50,500,200,60"" -signpage 1 " & strLicenseKey & " """ & strInFile & """ """ & strOutFile & """"
VeryPDF Black Border Removal SDK, Black Border removal Library. Remove blackborder after scanning. Ask Your Question 0 Remove black border lines around image after scanning. 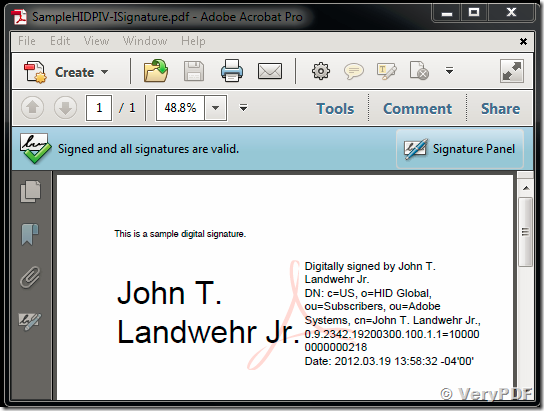 This entry was posted in VeryPDF SDK & COM and tagged certificate pdf, digital signature. Bookmark the permalink. 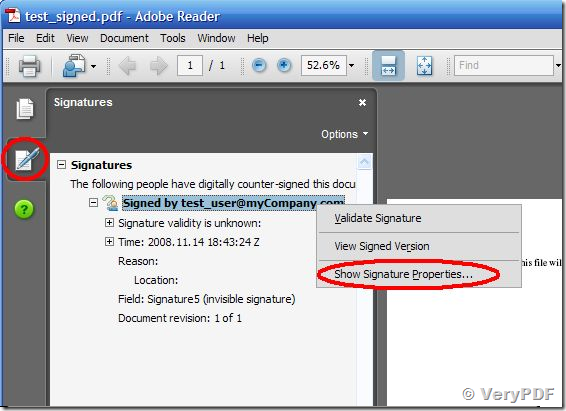 One Response to How to add a certificate sign to PDF files? We require command line PDF Password protector. Let we know the Advantage and prices details. Could you please sent the price details. These products are all can protect PDF files, "VeryPDF PDF Security and Signature" is the best in this market. 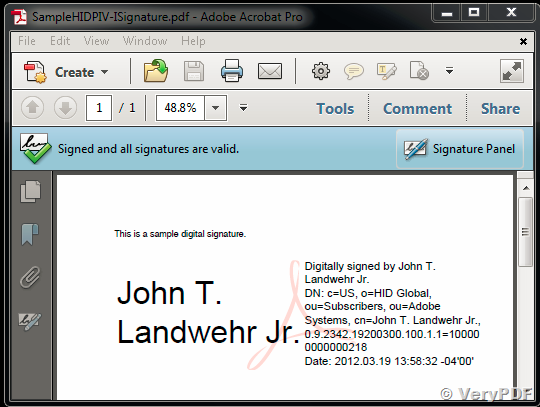 VeryPDF PDF Security and Signature (Shell & COM & SDK) is a cost effective application that allows you to digitally sign, timestamp and/or encrypt PDF files. By applying a digital signature on your PDF documents you will be able to guarantee the integrity of the content and also provide an additional level of trust in any business transaction you conduct. If you are a developer you can easily integrate VeryPDF PDF Security and Signature (Shell & COM & SDK) with your own application via a COM object or .NET assembly. You can refer to the price information from their web pages.